BLAIRSVILLE, Ga. – Students, faculty and staff of the Union County School System who suffer sudden heart attacks may be saved by new equipment donated by Northeast Georgia Physicians Group (NGPG) Cardiology and The Medical Center Foundation of Northeast Georgia Health System. Dr. Lewis McAfee, superintendent of Union County schools, accepted the donation of four automated external defibrillators (AEDs) Monday, January 25, at Union General Hospital. 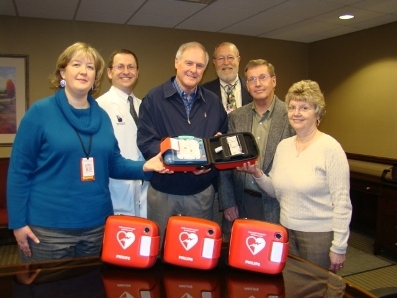 The AEDs are designed to be used by anyone, including non-medical personnel, to treat heart attack victims in emergency situations. An automated voice gives the user step-by-step directions to use the defibrillator to shock the victim’s heart in an attempt to correct the heart rhythm and stabilize the victim until medical help can arrive. "This equipment gives heart attack victims the best chance to make it the hospital," says James Varnell, MD, a cardiologist with NGPG Cardiology in Blairsville who is also on-staff at Union General Hospital. "We’re happy The Medical Center Foundation was able to provide the money to help us donate the equipment, which means immediate help will always be available in the schools." The Medical Center Foundation is the fundraising arm of Northeast Georgia Health System, which includes Northeast Georgia Medical Center (NGMC) in Gainesville. "Northeast Georgia Medical Center and Union General Hospital have a great tradition of working together," says Tom Edwards, director of Heart & Vascular Services at NGMC. "Because NGMC is home to the state’s #1 heart program*, we feel a responsibility to take care of the hearts of everyone throughout the region." Dr. Varnell practices at NGPG Cardiology, a collaboration between NGPG and Northeast Georgia Heart Center, in Blairsville. Call 706-835-1914 or visit www.ngpg.org/cardiology for more information. Also present at the donation were Mark Leimbach, MD, a cardiologist with Northeast Georgia Heart Center and chairman of the department of cardiology at NGMC; Sonya Smith, Annual Gifts Senior Coordinator for The Medical Center Foundation; and Rebecca Dyer, Administrator of Union General Hospital. *Northeast Georgia Medical Center is rated #1 in Georgia for Overall Cardiac Care by HealthGrades for the fifth consecutive year. To learn more about NGMC’s ratings, visit www.nghs.com/heart.